The Milwaukee Bucks have been the best team in the Eastern Conference this season. They’re 41-13 (a 62-win pace), have won six in a row, and 12 of their last 13. They’re two games up on the Raptors, 6.5 up on the Sixers and Celtics, and show every sign that they’re gunning for the #1 seed in the conference. A remarkable 22-4 at home, the Bucks possessing homecourt advantage in the playoffs should be a scary sight for all opposing teams. The advanced numbers, if anything, are even more favorable for the Bucks. They have an incredible Net Rating of 10.0, by far the highest in the entire NBA (2.5 ahead of the surging Warriors). The Bucks have the third-best offense in the NBA and the strongest defense, placing them as the only team in the top five in both categories. More worrying for the opposition, they’ve only improved as the season has gone along, bolstered by the addition of George Hill early in the season, and by the improvement of young players such as Sterling Brown and DJ Wilson. The arrival of Nikola Mirotic (more on him later) makes the Bucks even more threatening. Head-to-head matchups in the regular season aren’t always that important, but the Bucks’ winning ways against their top competition is notable, nonetheless. They’re 3-1 against Toronto, 1-1 against Boston, 1-0 against the Sixers, and 1-1 against the Pacers, adding up to a 6-3 record against the other teams battling for homecourt in the Eastern Conference. They haven’t just feasted against bottom-feeders: they’ve been legitimately good against strong playoff teams as well. They obviously have several against Boston and Philly to come, and those games will be fascinating to watch, but right now they’ve at least held their own thus far. Perhaps most importantly, the Bucks will have the best player on the court against any team in the East. As great as Kyrie Irving, Kawhi Leonard, and Joel Embiid are, none of them are as great, or dominant, as the Greek Freak, Giannis Antetokounmpo. With LeBron injured for much of the season, and the Warriors guys siphoning votes away from one another, Giannis has to be the frontrunner for MVP right now – and deservedly so. The numbers he’s putting up are simply ludicrous, and he’s doing it all while being the backbone of the best defense in the NBA. All of those other teams have guys who can theoretically guard Giannis, but nobody in the NBA has really proven able to slow him down much this season. In the playoffs, having the best player in a series is massive, and the Bucks possess that trump card. 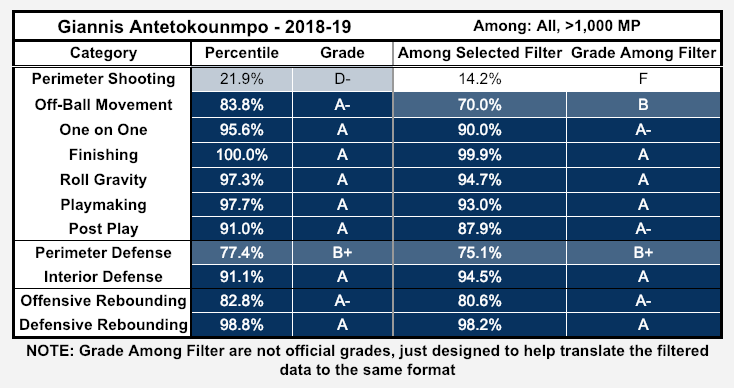 To further emphasize Giannis’ dominance, here is a look at his BBall Index talent grades vs all players this season, as well as vs players with at least 1,000 minutes played this season. The percentiles shown indicate the percentage of the NBA he grades out better than, and the grades are derived from the percentiles. Nikola Mirotic will help the Bucks a lot. On a team that loves shooting threes, Mirotic is immediately the most prolific and dangerous three-point threat on the court. He took 11.7 threes per 100 possessions with the Pelicans this season, which would be the most on the Bucks, and shot it at 36.2%. Additionally, while he’s not a good interior defender, his size and at least acceptable mobility means he can play small-ball center (or really, power forward with Giannis in the middle) against teams which downsize against Brook Lopez. He’s not as good as Tobias Harris, or Marc Gasol, but he’s a great fit with the Bucks, and three-point shooting is the most important skill the Bucks need around Giannis. The Bucks check all the boxes of a potential NBA Finals team. They have the record, the advanced analytics, the eye-test (my god are they scary when their outside shots are falling), the depth, and the star power. They have veterans with playoff experience, young guys who can rise to the occasion, and a superstar that is terrifying every second of every game. The Celtics have not come together as thought, the Sixers have worse depth and bigger fit issues, and the Raptors have health problems. The Bucks are not a full tier above those teams, yet at this point, post-NBA deadline, they should be the favorites to come out of the Eastern Conference.